See bottom of this page for other buying options, including printed books and Kindle version. BionX, Brompton Folding Electric Bikes, Currie IZIP Zuma, Dahon Folding Electric Bike, EcoBike Vatavio, eFlow Nitro, Emotion Neo City, Emotion Street 650, Elite Electric Bikes, eZee ForZa, Haibikes, Haibike Xduro Trekking RX, IF Reach Folding Bike, Kalkhoff, Kettler Twin, Montague Paratrooper Folding Mountain Bike, Optibikes, Pedal Easy, Sanyo Eneloop, Scwhinn, Strida 5.0, Stromer, Tern Verge, and Emotion BH Race Bike. Are you planning to buy an electric bike, but overwhelmed by all the choices out there? Do you feel it’s hard to figure out what to buy, with all those choices of bikes, motors and batteries? Are you feeling anxious about this, because electric bikes are expensive and you don’t want to make an expensive mistake? Are the sales people and the competing web sites just making it harder to choose? Know all you need to know about the technology of electric bikes, so that you understand the sales person and can ask the right questions. Be totally clear and certain about what you are looking for, so that you can pick out the best electric bike for you. Be fully informed all about the different kinds of bike motors, so you can make an informed decision about what’s best for you. Know all about the different kinds of bike batteries, and be clear about how battery power is measured, so that you can make an informed decision about what’s best for you. Be empowered to see beyond the sales pitches that tell you an electric bike can do 120 miles or more on one charge. Prove to your spouse that your electric bike will save you money, improve your health, help you lose weight, and just generally become a much better spouse! The updated 2015 edition of How to Buy the Best Electric Bike has all the information you need to buy the best electric bike for you. This is the fully interactive PDF version of this book. See the bottom of this description for OTHER BUYING OPTIONS. This book is a complete guide to buying the best electric bike. It’s an expanded, updated edition of our previously published How to Buy the Right Electric Bike. This new edition contains reviews of many of the most popular, high quality electric bikes. With a complete explanation of the technology and benefits of electric bikes, this book contains everything you need to know to buy the best electric bike in 2015. This expanded edition includes reviews of a range of popular, high quality electric bikes, including BionX, Brompton Folding Electric Bikes, Currie IZIP Zuma, Dahon Folding Electric Bike, EcoBike Vatavio, eFlow Nitro, Emotion Neo City, Emotion Street 650, Elite Electric Bikes, eZee ForZa, Haibikes, Haibike Xduro Trekking RX, IF Reach Folding Bike, Kalkhoff, Kettler Twin, Montague Paratrooper Folding Mountain Bike, Optibikes, Pedal Easy, Sanyo Eneloop, Scwhinn, Strida 5.0, Stromer, Tern Verge, and Emotion BH Race Bike. how electric bikes improve your health and fitness. Buy it right here as a full color 179-pages PDF (just click on “Add to cart” at the top of this page). The PDF is fully interactive, searchable and has a clickable table of contents. Each page includes a link back to the Contents page for easy navigation, as well as backwards and forwards buttons. Once you pay, you get an instant download. You can download it up to 6 times. The link will expire after 7 days. 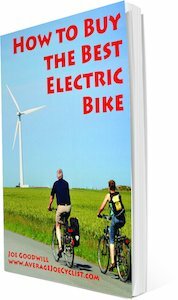 Buy this book now, and find out all you need to know about electric bikes. Then buy your bike and start getting fit, healthy and strong. Turbo Bob, blogger and online electric bike expert: “For anyone with the desire for these bikes, or just becoming aware of them, they will soak-up every page. If that is you, then putting this book on your reading list would be wise. I could go on (and I often do), but it isn’t my goal here to copy and paste his book, just convince you to read it for yourself. I also fully believe you should get a copy for each person in your life that you care for. When you read the book you will know why.” Read Turbo Bob’s full review here.